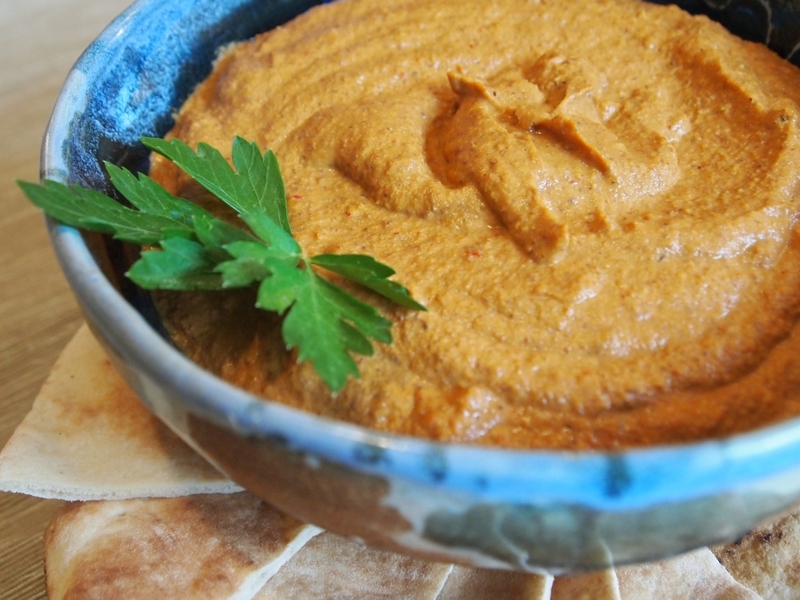 Muhammara is a delectable dip, typically made with roasted aleppo peppers, walnuts, and lemon juice. Being in Texas, however, we mixed things up a bit and used sweet Carmen peppers (from Johnson’s Backyard Garden), pecans, and key lime juice. The result is amazing! Note that this recipe calls for pomegranate molasses, which really are a key ingredient. Look for them at your local Mediterranean grocer (such as Phoenicia in Austin) or in the international food aisle of your grocery store. You could also use reduced balsamic vinegar as a substitute. If you can’t find Carmen peppers, use 2 to 3 large red bell peppers in their place. Place the peppers on a baking sheet and coat lightly with cooking spray. Broil on high, turning peppers occasionally, until the skins are blistered and blackened evenly. Place the blackened peppers in a large bowl, cover, and let them steam themselves for about 5 minutes. Remove the stems, seeds, and skins from all the peppers. In a large pan, lightly toast the pecans. Don’t burn them, but get a nice even toast so that the pecans become slightly fragrant. Place skinned peppers, toasted pecans, garlic, harissa, olive oil, pomegranate molasses, and lime juice in a blender or food processor and process until smooth. Salt to taste. Serve with pita, crackers, sliced cucumbers, or use as a sandwich spread!